It seems I've been all about soft pretzels, muffins, and donuts as of late. Any objections? Good. I made this recipe a few weeks ago for a work potluck, but there wasn't time to photograph the pretzel bites. I had to make the recipe again (Oh, woe is me!). These taste just like little bite-sized pieces of those delicious cinnamon sugar mall pretzels. I've also included a cream cheese dipping sauce, which is the perfect amount of tanginess to go with these delicious pretzel bites! 1. Combine warm water, yeast, and 1 tsp of sugar in the bowl of a stand mixer. Stir with your finger, then let it sit for about 10 minutes to activate. 2. Add the remaining 2 tbsp of sugar, the brown sugar, veggie oil, and salt. Stir. Attach the dough hook and add the flour. Scrape the sides of the bowl as needed. Knead in the mixer for about 4 minutes or so, or until elastic and smooth. 3. Put in a greased glass bowl and let rise, covered, in a warm oven (about 140-150 degrees fahrenheit) for about 30 minutes, or until doubled in size. After removing from the oven, preheat the oven to 425 degrees fahrenheit. 4. Combine hot water and baking soda. Divide the dough into 6 equal parts. Take one part and cover the other parts with a kitchen towel so they don't dry out. Roll the section into a snake about 28-30 inches long. Cut it in half, then each in half again. (4 snakes) Divide each into about 1-1/4" sections. 5. 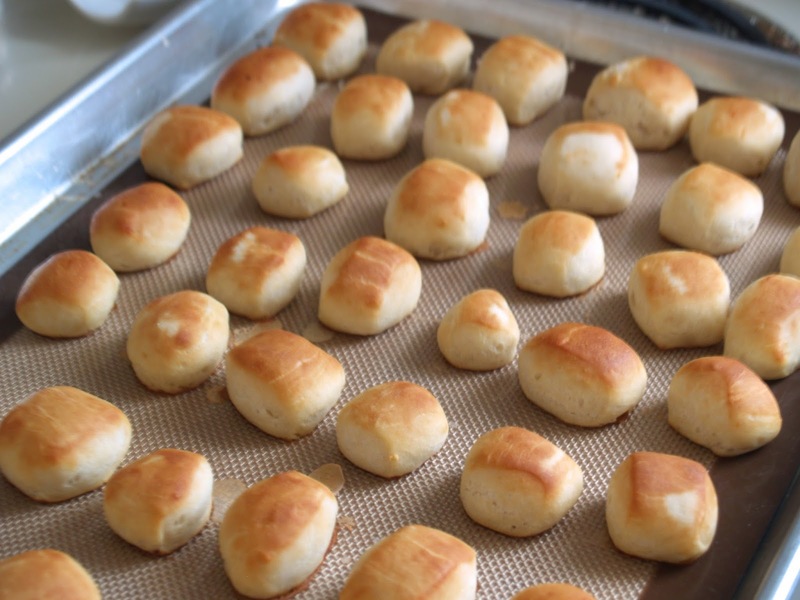 Dip each bite into the hot water/baking soda mixture, then place on a silpat-lined (or parchment paper lined) baking sheet. Repeat with the remaining sections of dough. 6. Bake at 425 for 7-10 minutes, or until the tops are golden. 7. Roll in the melted butter, let sit on a plate for about 1 minute to let the butter soak in, and then roll in the cinnamon sugar mixture. Combine cream cheese and butter. Add powdered sugar and vanilla. Beat. Add milk, if needed, to attain the desired consistency.